The mailing list is one of the most effective marketing instruments. Social media is getting more and more important, but mailing lists are still more important in regular communication, lead generation and sales. Stop trying to fix falling reach in social channels and convert your fans and followers into subscribers. Here are 20 methods how to increase the sign-up rate on your web properties and offline. Newsletters are boring, and I don’t have time to read them. Our experience has shown that when you replace “join our newsletter” with clear points what the newsletter will contain and why you should join, then the sign-up rate will increase several times. Action: Replace “join our newsletter” with a message that conveys value to your reader. One of the best tactics to build your list is to give something in exchange for the email address. Create a white paper or short course and let people sign up to get that material. Again, you will see a very substantial increase in sign up rate. Giving value that is specific to your industry ensures that people who sign up are members of your target group. These are also called content upgrades. Make sure this is something people really want, or they won’t sign up. Action: Create content upgrade material and add it to your blog posts. Joining your mailing list should be easy! So, add the sign-up box to every page. You can also create a dedicated sign up page which tells the visitor what value they will get if they join. This can be enhanced with welcome mats, behavior triggered pop-ups and exit pop-ups. Action: Make sure you have a sign up form on every page. Visitors who are in the process of buying or some other important transaction has already given you a big YES. Use that positive state of mind to ask for a small yes of joining the list. Action: Put a newsletter permission checkbox in your transaction process. You think that transactions, especially buying process, are so important that you have to remove all clutter, even the checkbox for the mailing list. No worries, add the mailing list sign-up to the thank you page. It works the same way as asking for a sign-up during the transaction. If you got the big yes of the transaction, the small yes is easy to come. Action: Create thank you pages that ask visitors to sign up for email list. Transactional email is sent to confirm some action visitor has just taken. These emails get opened and paid attention. Ask them to join the mailing list and use the transactional email itself as an example of what they can expect in the future. Transactional emails are often overlooked but deserve a lot of attention. Action: Check all your transactional email and make sure they contain a call to action for a mailing list or other marketing messages. Find out if any of your partners have a list where you can add value. Create an offer or message that is useful for the subscribers of that list. Best tactic would be to use something that they would need to sign up for. Don’t try to sell in your first interaction, try to get them to join your list. Action: Find out which of your partners have a mailing list and offer them useful content. Look for industry newsletters or sites that sell the opportunity to include your message in their regular communication. As with partner lists, find the value that would make the recipients interested enough to sign up for your offer. The trick is the relevance of the list. If you sell industrial machinery, don’t send the message to teenage girls, even if the list is free. Action: Research industry associations and portals in areas where you want to get clients. 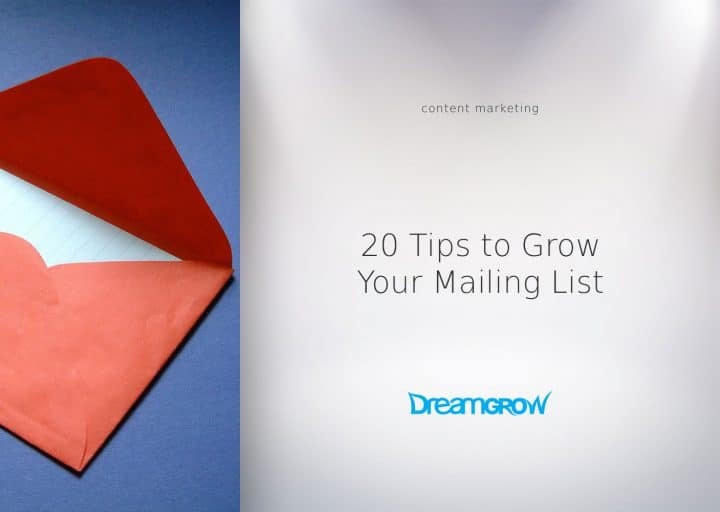 Ask them if they will include your content in their newsletter. Create a tool that your audience finds valuable and solve their problems. You can then send the results to an email address or ask for one in the process of using the tool. 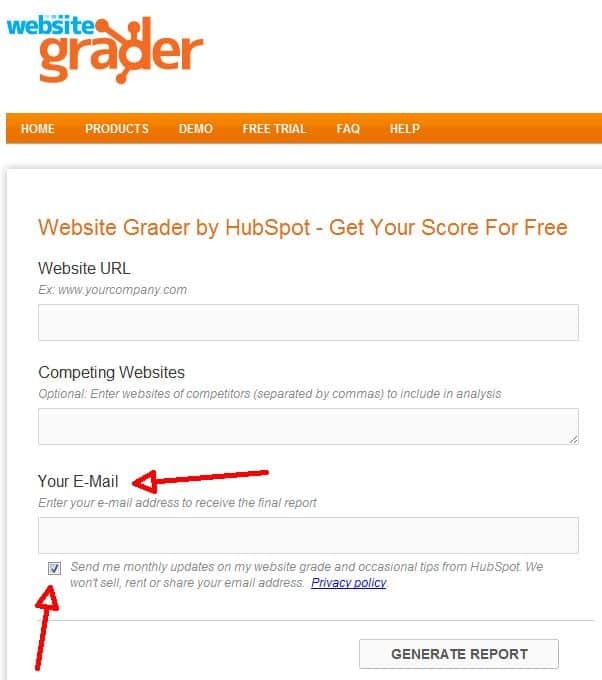 One great example is Website Grader by HubSpot. Too complicated? You can create a simple tool with just multiple choice questions. Grade the answers and ask for an email address for sending the results. Actions: what 5 to 10 questions can you ask and grade to create a tool? Every email that you send to your list should encourage people to forward it to a friend or colleague. Ask people to sign up in your social media channels. Create a special page that asks people to sign up and gives clear reasons why they should do that. You can also post about the newsletter only offer on your social channels. Action: Create a Facebook app to collect email addresses. Read How To Set Up a Custom Facebook Landing Page App. When you are speaking at an event, ask your audience to sign up. Tell them that they can sign up for your newsletter on every page of your website and get the information they are paying right now for free, forever. Additionally, if you are the organizer of the event, then you can add mailing list sign up to the feedback form. Action: Add a slide to your presentation deck that promotes your newsletter. Product data sheets, brochures, and other printed material should include the information about signing up for more. You can also point readers to existing content upgrades. Action: Write a short copy with a call to action that you can use in your printed materials to get people on your list. The older brother of email newsletter is a great opportunity to ask people to continue the discussion online. Ask them for feedback online that includes newsletter sign up with or without giving up the dead tree version. Action: Create a boilerplate copy to use in offline mailings to direct readers to sign up for the email list. Action: Create a sign up form for your offline location. When customers join your loyalty programs, always ask permission to send them an email. It might seem blindingly obvious but make sure you really ask for permission. 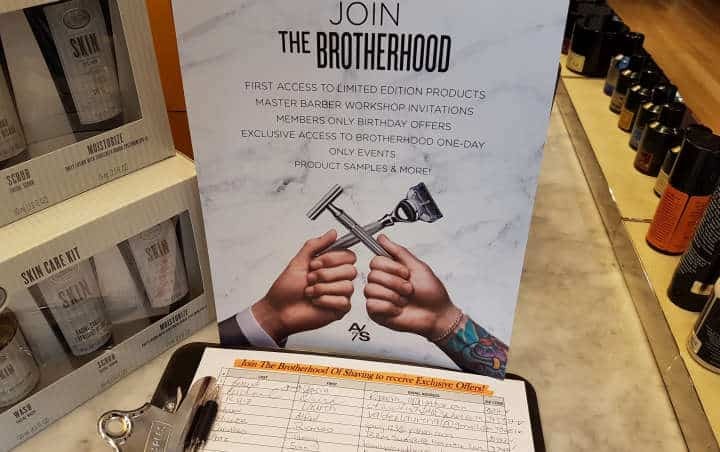 Action: Include the right to send email in the terms of your loyalty program. Action: Remove “it’s safe to join” from your sign up form. Concentrate on the quality of your mailing list. It’s more important that the people on the list actually care about what you have to say than how big is the list. 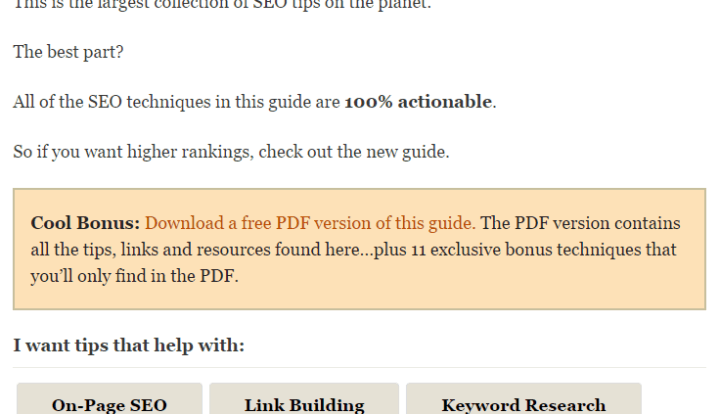 Make sure you use double opt-in to avoid pranksters and robots. This will also ensure that people who will not get the confirmation email will not end up on your list. Action: Turn on double opt-in on your sign up form. Ask only for most important information. In the simplest form, it’s the email address. Don’t ask for birthday, shoe size or grandmother’s maiden name in the first encounter. You can always refine the list later by offering incentives to give additional information. Some research has shown that the most converting version of the email sign up form has two fields. Name and email address. Action: Make sure you have two fields on your sign up form. If you are in contact with your audience, always ask them to join the list. Be it an offline meeting or a blog post about list building. At the bottom of this page is the sign-up form for our mailing list. Action: Sign up for more content marketing and social media advice. 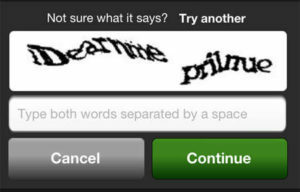 Action: Remove captchas from signup forms. 11 Reasons Why Your Email List Beats Social Media – Email is like a phone book of your friends, but social media is more like a casual acquaintance. Mailing lists give you more control over your communications. How to Use Social Media to Build Your Email List – Your email list is gold! Social media channels are a great way to get initial engagement and distribution but in the end the interested prospect should land in your email list. I like your tip to ask visitors to join a mailing list during transactions. Like you said, people buying something from you have already approved of you. They’ll be much more likely to want to sign up for your mailing list than if you had asked them when they just clicked on your site. Thanks for all the tips! I have actually seen this in a eating place next to my office. Just pen and paper on the counter to get the menu of the week on Mondays. Great tips. FYI #3 should be sign up, not sing up. However, I can sing for you if you’d like! Great tips indeed on how to grow email list.